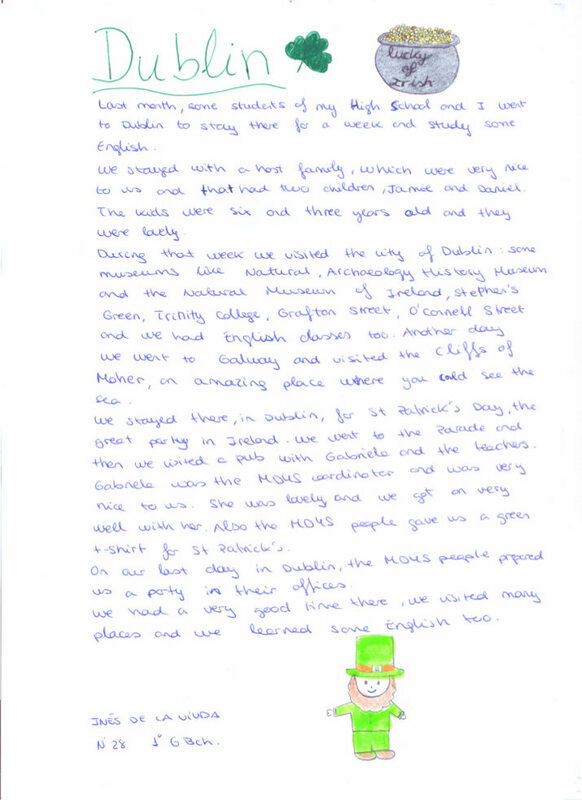 Last month, some students of my high school and I went to Dublin to stay there for a week and study some English. We stayed with a host family, which were very nice to us and that had two children, Jane and Daniel. The kids were six and three years old and they were lovely. During that week we visited the city of Dublin: some museums like Natural, archaeology history museum and the natural museum of Ireland, Stephen’s green, trinity college, Grafton street, O’Connell street and we had English classes too. Another day we went to Galway and visited the Cliffs of Moher, an amazing place where you could see the sea. We stayed there, in Dublin, for St. Patrick's Day the great party in Ireland. We went to the parade and then we visited a pub with Gabriela and the teachers. Gabriela was the MD4S coordinator and was very nice to us. She was lovely and we got on very well with her. Also the MD4S people gave us a green t-shirt for St Patrick's. Our our last day in Dublin, the MD4S people prepared us a party in their offices. We had a very good time there, we visited many places and we learned some English too.